Preheat oven to 450 degrees. Scrub sweet potato clean. Poke holes in sweet potato with fork. Bake on a foil lined baking sheet for 30 minutes per side. Separate Swiss chard from stems and cut into 2 inch pieces. Add 2 tbsp olive oil to a large saucepan. Sautée Swiss chard over medium heat for approximately 5 minutes. Drizzle with lemon juice. 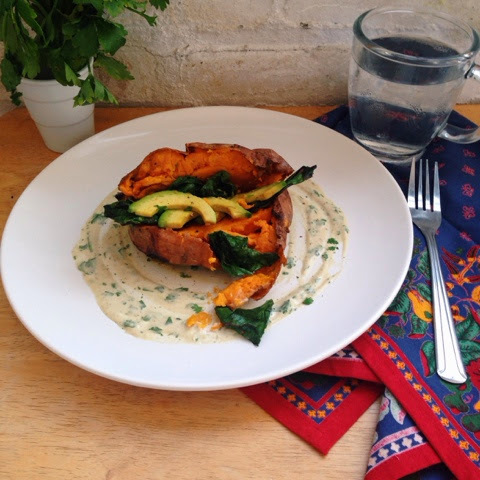 Slice open baked sweet potato and stuff with Swiss chard and avocado. Salt and pepper to taste. Mix all ingredients for sauce together in a small bowl until fully incorporated. Swirl sauce on plate and set stuffed baked sweet potato in center. Tada!